Tommy Whitworth lays down the heat on Jack Harris and Patti Schrickel. There, I said it. I can't really play footbag anymore. My hips just won't allow it. But I still love the game and the players that show up, so I can't stop running events. 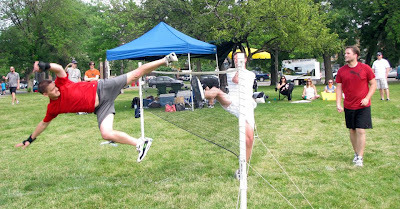 The Chicago Lake Coast Kickers are proud to announce the First Annual Kickin' It In The Park Event, which is intended to replace the Windy City Cup Footbag Championships. We are cordially inviting ALL footbag net players to come to Chicago on Saturday, May 26, 2018, for some fun, footbag, and friendship. This is NOT a tournament. We'll be playing pick-up games all day and going out to have some fun together in the evening. No entry fees, no prizes, no schedules to keep- just some great people hanging out, enjoying the game and each other's company. For anyone that is looking to make a weekend out of it, we'll be down for Sunday and Monday, too. Hope to see you there!